Nvidia recently announced it has kicked off the roll-out of another update for SHIELD TV, which brings a broad range of new features and improvements. First and foremost, SHIELD Experience Upgrade 5.2 adds the option to cast 4K YouTube and Netflix video to the SHIELD TV. Nvidia also announced that 4K cast would be available on additional apps based on region. Another notable new feature included in the update is support for Plex DVR with Live TV. You'll also be able to record shows to a NAS (Network Attached Storage). Obviously, you'll still need a Plex Pass, but Plex offers for a limited time a free six-month subscription with the purchase of a SHIELD TV. 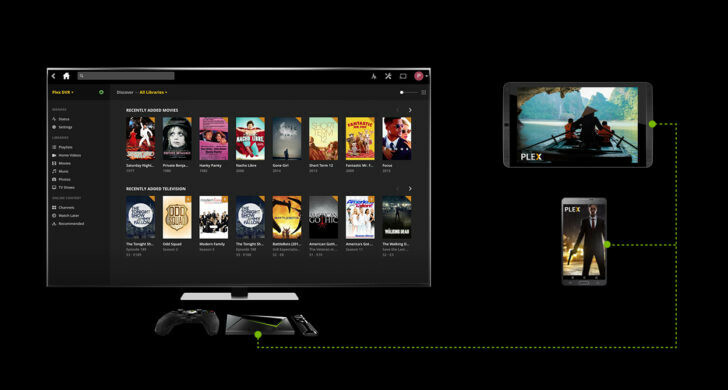 Furthermore, Nvidia confirmed that new apps and games would be added to the SHIELD TV, including realMYST for Android TV, Marvel Heroes streamed from GeForce Now, as well as a new Facebook video application. Lastly, a fair share of network storage directory and connectivity enhancements, Wi-Fi performance improvements, and experience enhancements for SHIELD remote and SHIELD controller have been added too.